Available for download on the Quakers de France website, the latest issue of “La Lettre des Amis“. PDF file, in French only. See also: Quaker Peace and Social Witness on Twitter. The latest issue of our thrice-yearly newsletter is available for download in PDF format from the national “Quakers en France” website. Click here for subscription info and access to back issues. A new book by Frédéric Anquetil tells the story of Annette Monod Leiris, a Quaker who was practically the only person able to help the thousands of Jews who were rounded up by the French Vichy authorities in July 1942, and detained in horrific conditions in a Parisian cycling stadium before being deported to the death camps. Annette, whose role during the infamous “Vél d’Hiv” round-up is also shown in the 2010 French film “La Rafle“, went on after the war to work tirelessly for prisoners, and also helped set up the Association of Christians for the Abolition of Torture, or ACAT, which is still going strong today. 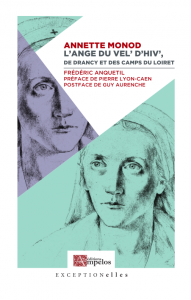 Frédéric Anquetil will be at the International Quaker Centre in Paris at 2:00 pm on Sunday, February 3, 2019 to give a talk about his book, “L’ange du Vél d’Hiv” (The Angel of the Vel d’Hiv round-up). In 2009, Ben Pink Dandelion published Celebrating the Quaker Way, a brief handbook that was to be translated into many different languages. Thanks to Quakers in the western French city of Nantes, there is now a French version, in six episodes. The dead are all on the same side. Today atone for the same defeat. One combat and one victory. 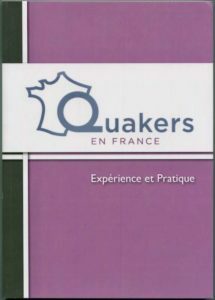 Launched during French Yearly Meeting, which took place in Paris from Saturday October 27 to Tuesday the 28th, the new work provides a history of Quakerism in France along with a rich store of quotations and French versions of Advices & Queries and a chapter on Faith and Practice. Our French-language newsletter, now published three times a year, is available on the “Quakers in France” website in PDF format. The latest issue, dated September 2018, includes articles on possible new premises for the International Quaker Centre in Paris, on the “Stop Fuelling War” campaign against the international arms trade and on the upcoming French Yearly Meeting gathering. Links on the site allow readers to subscribe by e-mail, and also to receive the newsletter via postal mail. Friends’ Meeting every Sunday, from 11 to 12, followed by a shared lunch.